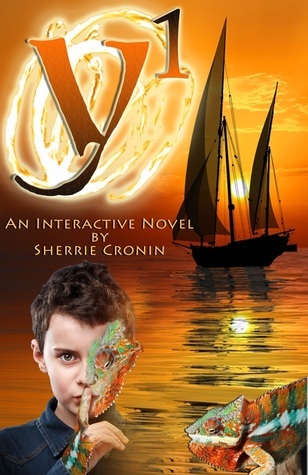 Y1: An Interactive Novel by Sherrie Cronin (9780985156176): Cinnabar Press (2012). Zane Zeitman is a bright and talented 24-year-old with an unusual gift: he can alter his appearance in extraordinary ways. He wants to make a difference in the world but instead finds himself slogging away in the salt mines of the research department of a pharmaceutical company. He sees an opportunity for change when he is transferred to the Marketing department, but soon finds that the more he learns about his company’s practices, the more disturbed he becomes. A business jaunt to the South Pacific introduces him to new friends, fire dancing, the love of his life, a sadistic ‘boot camp’ for troubled teens, and a murder charge. As secrets begin emerging that someone desperately want to keep buried, Zane must call upon his abilities to not only ferret out the truth but keep himself, and his friends, alive in the process. Y1 is a companion novel to Cronin’s previous effort, X0. Zane is the son of Lola Zeitman, the main character of the previous work. While there are references to the Xo in this work, Y1 can definitely be read independently. Like the previous novel, Y1 has a lot to like. The explanation for Zane’s unusual abilities is original and entirely plausible. Most of the characters are extremely sympathetic and infinitely likeable. The plot keeps up a good pace and draws the reader into wondering how things happened. In fact, the book is less of a “whodunit” than a “howdtheydoit”. It’s pretty clear who the bad guy is throughout the book–the only surprise being just how bad he really is. My only true complaint about the novel concerns the series of epilogues at the end. Through them, we get to see how life goes for Zane some 40-60 years after the events in the novel. While interesting on their own, I don’t think they added anything to main story. The novel could have easily ended without them and have been completely satisfying. That said, Cronin writes such likeable characters that you don’t truly mind sticking around the party a little longer, even if it is after the main body of guests have left. One caveat: The novel is billed as an “interactive” novel and is filled with reference links that take the reader to more information about topics addressed in the book. Due to tech gremlins on my end, I am unable to comment on the accessibility of those links and whether or not they, indeed, added to the experience. In the end, Y1 is a satisfying and enjoyable read and an able companion to X0. This entry was posted in Reviews and tagged fiction, novel, review, sci-fi, sherrie cronin. Bookmark the permalink.